See the article below for a new discussion of this topic. An intense lobbying battle is being fought as the Indian government prepares to amend landmark legislation introduced nearly three decades ago to protect women who were being attacked, harassed and even murdered for refusing to pay dowries. Amid an increasingly vocal campaign by "men's rights" organisations, who claim the law has been misused in order to extort money from husbands, the government has asked its legal advisers to investigate and suggest options for reform. Women's groups say the legislation is vital to protect countless numbers of brides against violent demands for dowries and must not be watered down. They claim that up to 25,000 Indian women are killed every year because of the inability or refusal of their families to make such payments to the family of grooms. 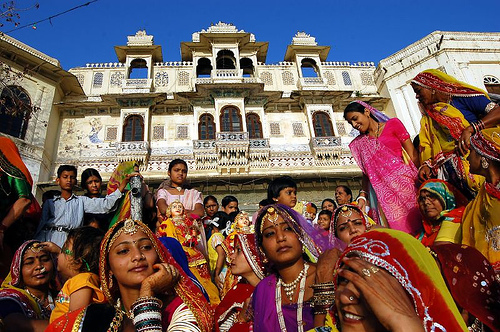 The payment of dowries was banned in India in 1961 but remains commonplace and may be on the rise. In 1983, Section 498a of the Indian penal code was introduced to offer additional protection to women, by ruling that any husband or member of his family convicted of "cruelty" or violence associated with attempting to force such payments should face up to three years in jail. The culture war being fought in newspapers and between activists highlights subtle changes in Indian society and an increasing willingness among some women to report domestic abuse. Women's groups say the campaign by men to change the law is nothing more than a backlash from those opposed to female empowerment. Mithun Kumar is typical of those who say the anti-dowry laws are being misused. The 30-year-old from Bangalore, employed in the IT industry, had an arranged marriage in 2007. He claims he discovered his wife was continuing to keep in touch with a previous boyfriend and wanted to maintain an affair with him. "She said if I didn't go along with it, I would go to jail," he said. Mr Kumar said his wife and her family then filed a case against him with the police, claiming he had demanded a dowry from them. He told the police he was innocent, but was arrested anyway. He is fighting the case in court. Rajesh Vakharia, a self-employed 42-year-old from Nagpur, claimed his wife and her family made similar allegations five years after their arranged marriage in 1999. "I was held for six days in the police station," he said. "She wanted to extort money from me. I would not pay and fought the case. Eventually I won, but for fours years I was not able to see my son. What is happening in India is very sad. There is no protection for men." The campaign to scrap Section 498a is being led by groups including the Save the Family Foundation. An official, Niladri Das, claimed men in India were increasingly resentful of "biased" laws. He said that more than 95 per cent of men charged under 498a were later acquitted and that was proof the law was being misused. "A woman can make any accusation she wants," he said. He said claims that 25,000 woman a year were killed was "a lie propagated by feminists in order to get money from international NGOs". He added: "We are not saying there are no cases, but these figures are highly inflated." The government appears to agree with the men. Law minister M Veerappa Moily recently referred the legislation to the country's law commission, which advises the government on legal reform. The commission's chairman, PV Reddy, a former supreme court judge, said they would soon be publishing a consultative paper. "There is misuse, it's been referred to in court judgments," he said. "There is misuse in regard to any law, not just this one. But this is not an ordinary crime. It's about marital discord. It's a very sensitive issue." Women's rights campaigners say any dilution of the act would be a big mistake. They argue that women face widespread sexual and physical abuse in India and say that if a law is being misused, then the police and courts need to act more efficiently rather than change it. They also argue that the continued practice of dowry payments in the country, and the attendant preference for male children, has helped contribute to the widespread abortion of female fetuses. The problem is so prevalent that in some parts of India there is a marked gender imbalance. A 2001 census found that in Punjab for every 1,000 boys there were only 793 girls. Donna Fernandes, a veteran women's rights campaigner from Bangalore, said she knew of no empirical evidence that showed 95 per cent of men charged under Section 498a were acquitted. Furthermore, she insisted, an acquittal did not necessarily amount to a misuse of the law as women may withdraw an allegation because of pressure. She said: "Women are moving ahead. Today they are more economically independent. They don't need marriage. They say 'To hell with it if he can't respect me.'" Ms Fernandes said her organisation, Vimochana, collected statistics from Bangalore that showed up to 100 married women were being murdered in the city every month, though not all were necessarily related to dowry payments. She added: "If this law is being misused, then why are so many women dying?" Among those urging the authorities to retain the law is Girender Singh, from Delhi. His 24-year-old daughter Anshu was found dead in January last year, just 45 days after she was married. Mr Singh said Anshu's husband's family had repeatedly made demands for money and while he did not pay a formal dowry, he handed over around £6,000. His daughter's husband was arrested on a charge of murder and the case is before the courts. Mr Singh declined to talk about Anshu's case but instead forwarded a copy of a letter he had sent to the authorities in which he expressed his "pain and agony" and asked they not dilute the legislation. "In truth, is there any law to save girls and married women in India except 498a?" he wrote. "A little fear of 498a might save the girls and women from heinous crimes which are on a rising trend in our great Indian society."